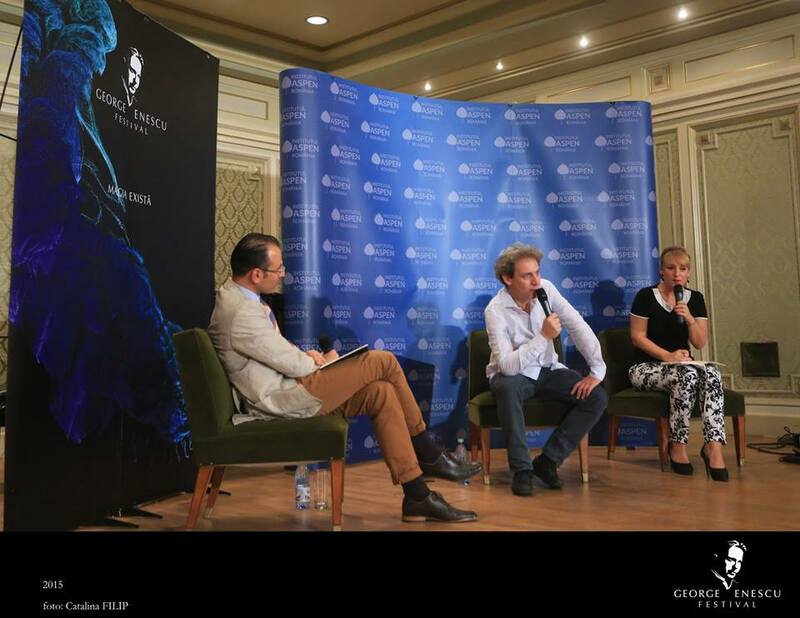 Aspen Institute Romania opens the 2015 Festival of Ideas with a special event focusing on music, culture and identity on Monday, September 14 together with guest speaker Mr. David Grimal, world renowned violonist in conversation with Ms. Oana Marinescu, Communication Director of George Enescu International Music Festival and Mr. Andrei Tarnea, Executive Director of Aspen Institute Romania. In Romania at the invitation of the George Enescu Music Festival, Mr. Grimal plays a Stradivarius, the “ex Roederer” from 1710, as well as the “Don Quixote”, a violin made for him by the French luthier, Jacques Fustier. After studying at the Conservatoire National Supérieur de Musique of Paris under the aegis of Régis Pasquier, at which time he received advice and encouragement from such renowned artists as Schlomo Mintz and Isaac Stern, David Grimal spent one year at the École des Science Politiques de Paris before his life-changing encounter with Philippe Hirshhorn. David Grimal pursues an international career as a solo violinist, which has seen him performing regularly over the past twenty years in the world’s leading classical music venues and with prestigious orchestras such as the Orchestre de Paris, Orchestre Philharmonique de Radio France, Russian National Orchestra, Orchestre National de Lyon, Chamber Orchestra of Europe, Berliner Symphoniker, New Japan Philharmonic, Orchestre de l’Op.ra de Lyon, Mozarteum Orchestra Salzburg, Jerusalem Symphony Orchestra and Sinfonia Varsovia, under the direction of Christoph Eschenbach, Michel Plasson, Michael Sch.nwandt, P.ter Csaba, Heinrich Schiff, Lawrence Foster, Emmanuel Krivine, Mikhail Pletnev, Rafael Frühbeck de Burgos and Peter E.tv.s, Andris Nelsons, Christian Arming, among others. He has been the honoured recipient of dedicated works by various composers, among whom are counted Marc-André Dalbavie, Brice Pauset, Thierry Escaich, Jean-François Zygel, Alexander Gasparov, Victor Kissine, Fuminori Tanada, Richard Dubugnon, Ivan Fedele, Philippe Harrowing, Anders Hillborg, Oscar Bianchi, Guillaume Connesson and Frederic Verrières. In addition, David Grimal has for many years taken part in recitals with George Pludermacher. They have toured worldwide and their collaborative discography, which features works by Ravel, Debussy, Bartok, Franck, Strauss, Enescu, Szymanovski and Janacek, has reaped countless awards (Strad Selection, 5 star BBC Mag, Arte Sélection, Télérama’s ƒƒƒƒ, etc.). David Grimal has recorded Schubert’s Sonatines with Valery Afanassiev. In 2009, his recording of Bach’s complete Sonatas and Partitas along with Brice Pauset’s “Kontrapartita”, a creation originally dedicated to David Grimal himself, was distinguished by a Choc de Classica – Le Monde de la Musique (France’s leading classical music monthly). His recording of Thierry Escaich’s Concerto for violin with the Orchestre National de Lyon was also awarded a Choc de Classica in 2011. Since 2008, David Grimal has been Artist in Residence at the Opéra de Dijon. He teaches violin at the Musikhochschule, in Sarrebrück, Germany. He also presides over many Master Classes and was a member of the jury for the Long-Thibaud International Competition in Paris, in 2010. He was appointed Chevalier des Arts et des Lettres by the French Ministre de la Culture in 2008.